A capture-the-flag security event sponsored by Raytheon, IBM, and Galois. 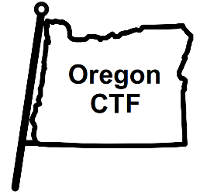 Run since 2013, OregonCTF has been held annually to help students learn and practice their security skills in a fun and challenging format. Because many CTFs are difficult for beginners to begin with, OregonCTF is focused on teaching and learning with a session dedicated to level walkthroughs and tool demonstrations. If you are interested in participating in next year's event, please contact Wu-chang Feng (wuchang at pdx.edu).